The only thing Kiefer isn’t procrastinating on is getting a new car. My 2-door Civic isn’t going to work once the baby arrives. It barely works now when I drive with Boo and Radley. We have 7 weeks left. Seven! To shake him up a little, I decided to take Darla’s suggestion and implement Operation Pickle Juice. If I give him a shot of Jameson before and immediately after, I think my prank will be better received by Kiefer. Find pickles in back of refrigerator. I haven’t craved them since the first trimester. Pour out some of the juice being careful to leave some pickles and juice for future cravings. Splash pickle juice all over my crotch, down my leg, and onto the floor. Scream at the top of my lungs so Kiefer runs into the kitchen and thinks my water has broken. Pray that he thinks it’s funny after I show him it’s just pickle juice. Call Ozzy into the kitchen to lick the floor so I don’t have to clean it up. Only one question remains: Should I use Dill or Bread and Butter pickle juice? Please free to leave SUV suggestions in the comments. When you visit Greece a month before your wedding, everyone asks if that was your honeymoon. The answer: No. No, it was not. Originally, Kiefer planned to propose in Greece. Just because he proposed early didn’t make Greece our honeymoon. When you’ve waited as long as Kiefer made me wait, you get as many trips as you want. So we’re doing two honeymoons: one just Kiefer and I after the baby is born and another with Boo and Radley. Our family honeymoon is this week. We’re headed to Florida to visit some friends, SeaWorld, and the Tampa Aquarium, where we will hopefully see Pete the Penguin. Who is Pete the Penguin? A penguin Kiefer got me when he went to Africa a few years ago. 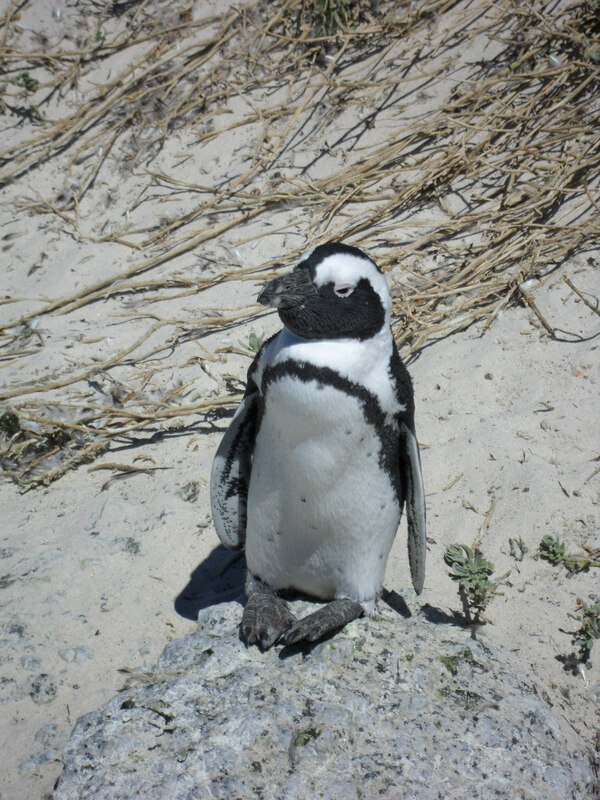 I’m in Cape Town today visiting the penguins, and I thought of you because you love penguins. I’m going to try and smuggle this little guy back for you. I’m not ready to marry you yet, but I am willing to commit to raising this penguin with you. Let’s name him Pete. Pete the Penguin. We’ll get him a butler suit and teach him to serve cocktails just like you’ve always wanted. 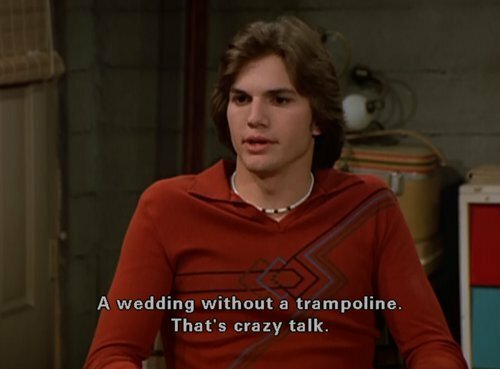 What’s a Wedding Without a Trampoline? It was cute. Nothing had changed, yet it had. But I think the best (i.e., worst) title slip-up took place just a couple days after the wedding. Kiefer: I guess I can’t call you my fiancee anymore. Thoughtsy: Oh…right…because we got married Saturday. Oops…I knew that. We didn’t have a trampoline at our wedding. That’s my excuse for forgetting. I swear my natural hair color is not blond. Sorry, Kelso. You have some competition. Last week I went to the local Social Security Administration to get a card with my new last name. Itwas great people watching. A man told the security guard he was stepping outside to smoke because smoking inside would damage the electronics. Seriously? How about damaging my lungs? My favorite was a middle-aged Russian woman. The security guard cannot answer any questions. Numbers are often called out of order because SSA workers specialize in certain areas. So what does the possibly Russian lady do? She asks the security guard about numbers being called out of order of course. Lady: My number is 110, and they already called 111. Did they skip me? My number is 111, and I have not been called yet. Security Guard: Ma’am, sometimes numbers are called out of order. I’m sure you’ll be called soon. The person who will help you is probably just finishing up with someone else. Lady: But my appointment was 20 minutes ago. Five minutes later, the lady and the security guard run through the same conversation. A few minutes later, a worker steps out and calls a name. Security Guard: ::pointing to Russian lady:: That’s her. Maybe the worker pronounced “Bueller” wrong, or maybe the lady was hard of hearing, but that seemed sketchy. The lady didn’t know her own name. Am I the only person who sees that as a red flag? Only one thing stinks from Kiefer and I’s wedding: no pictures…yet. We tried to keep our wedding on a budget, but we splurged on our photographers. They edit every single photo and then give us ALL of the photos. But we won’t get to see those photos for a couple months. Lucky for us, our friends took some pictures. Boo walked me down the aisle. Of course. there was a kiss. And then I took a more graceful exit. #5 on the 35 Before 35 List complete!